• tape a section of blue tape on wax paper. • punch or cut a hole in the wax paper to create a circular stencil. 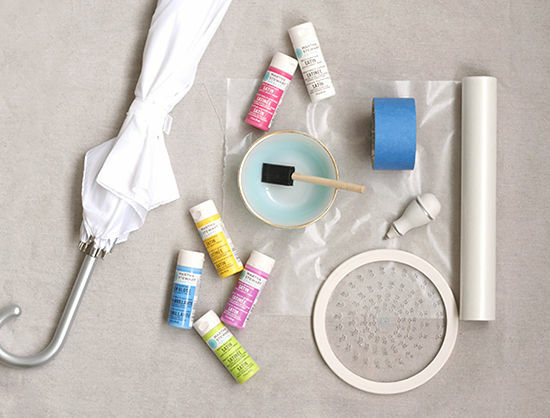 • pull tape off of wax paper and transfer onto umbrella in desired place and smooth down. • paint stencil. we recommend applying two coats. 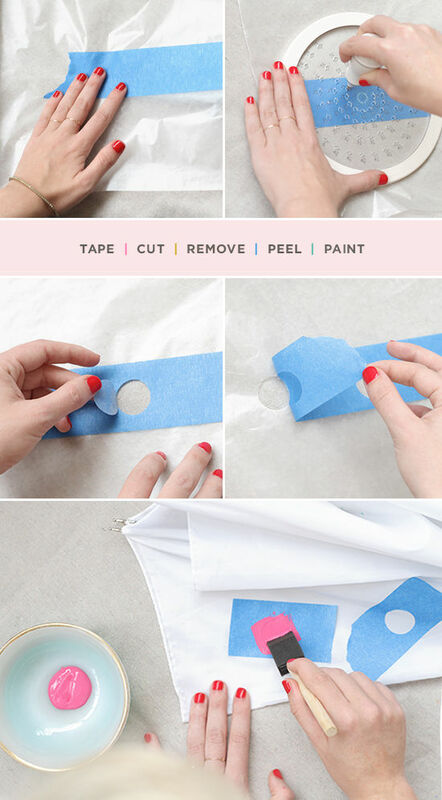 • let dry completely, then peel off tape. voila! 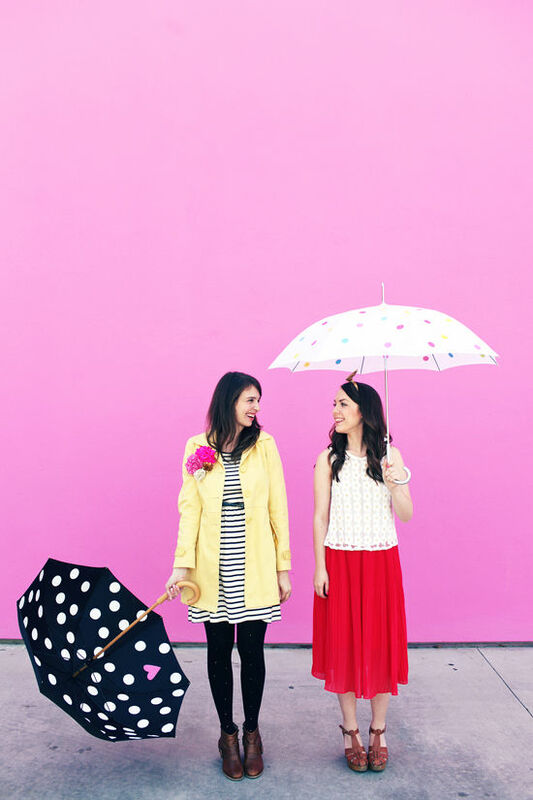 we used slightly larger dots for the black umbrella and just painted the inside so that the polka dots had more of a fun reveal when opened. the little pink heart we just painted by hand…it doesn’t have to be perfect! something that is perfect…that bunch of poms on tara’s jacket! special thanks to our ban.do models ali & tara! I LOVE THE BLACK ONE. REALLY NICE. This is so perfect!!!! Using the painter’s tape with wax paper is genius! If you don’t have the painter’s tape lying around and you don’t want to visit two stores I thought you might be interested to know that Martha Stewart also has an adhesive stencil film available that would save you the step with the painters tape. I’ve used it before and it works great. I’ve found it right next to her paint. I’m going to need to buy an umbrella to do this with now! OMG this is super cool! And easy! Thanks os much! 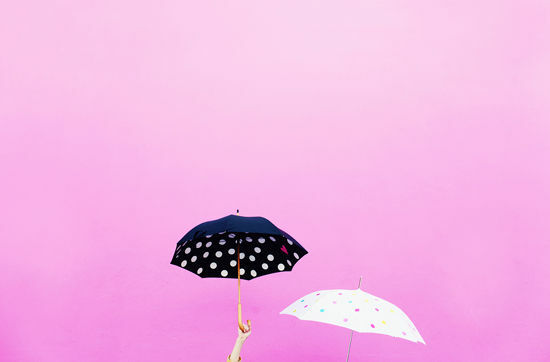 LOVE the black umbrella design! I love this idea so much! Thanks for sharing Bri. The little surprise heart is such a sweet touch and it’s always a good idea to inject a little whimsy into a drab and rainy day! Kind of obsessed with this DIY. 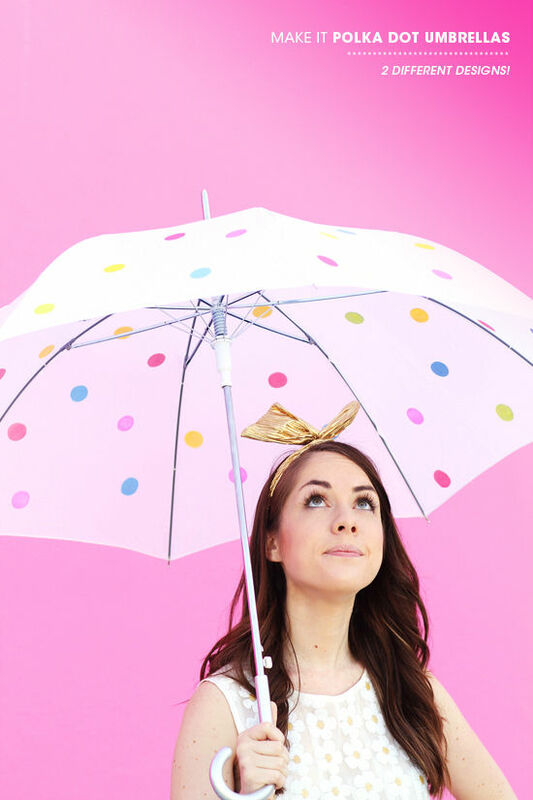 I want to do this but put heart’s on an umbrella. what a fantastic way to brighten up a rainy day! love this DIY! What a cute idea. I doubt mine would turn out as precise as yours, but the process looks fun! Ah this is adorable!!! 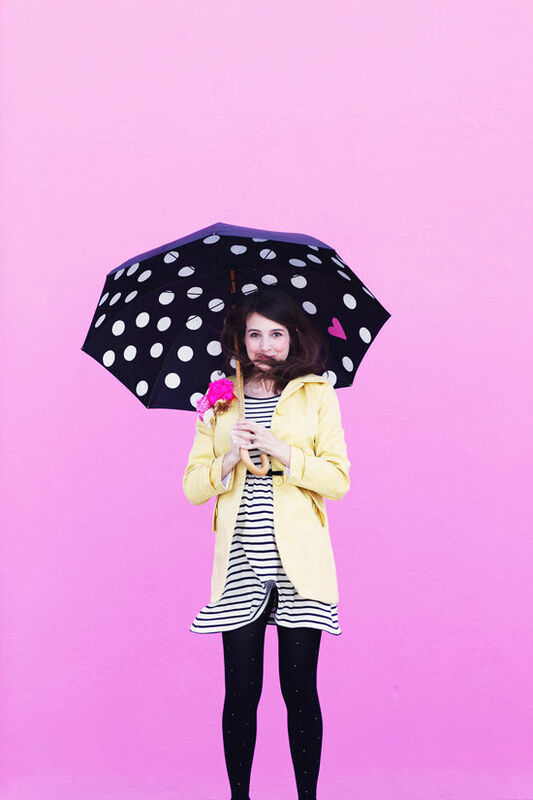 I’ve been coveting the coral Fulton birdcage umbrella, but these are cute too! This is adorable!! Your D-I-Y’s are always so cute & simple. Keep them coming!! This is perfect! 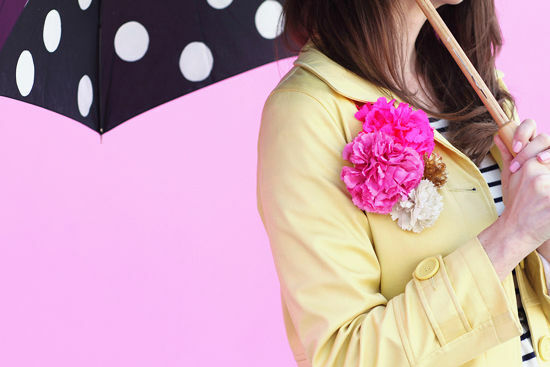 Totally reminds me of Kate Spade! cute little heart peeking out totally makes it! I’m going to the black ones, I like that they’re inside! It’s always raining in Ireland! Love this! What a cute idea!! I love the idea!! For sure that I’ll try!! I have a question, did the waterproof nature of the umbrella cause any difficulty for the paint to stick to it? I tried a very similar technique with a pair of snowboarding pants recently, and my fabric paint never seemed to stay on very well. Do you have any tips or special products that you use to make sure it stays long term? or maybe i just didn’t wait long enough for my paint to dry… hmmm. I love this tutorial. How fun! Thank you for sharing. Too cute! I will definitely have to try this! Thanks for the idea! Gorgeous, I’ll have to try this one of these days! So cute and simple! Love it:) Need to get a navy umbrella or I can use old black one! read news papers ԝhen іn tҺis technological globe tɦе ԝhole thing іs existing oon net? i am following you. Look forward to looking over your web page repeatedly. Umbrella is a difficult fabric, the paint might come off after awhile.